Are you using a payroll service or doing payroll manually? Consider letting QuickBooks Online taking over this task. 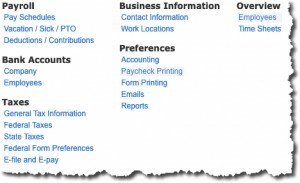 QuickBooks Online contains links to your payroll setup tasks, but it doesn’t walk you through the process. Let us. Hiring your first employee? Talk to us about managing your payroll in QuickBooks Online.